What Role Did the Canaanites Play int he Bronze Age Near East? Today, the ancient Canaanites are known mainly through the lens of the Bible, but they predated the Kingdom of Israel and played a major role in the history of the ancient Near East. Although the people of the ancient Levant (roughly equivalent to the modern nation-states of Israel, Palestine, Lebanon, and southern Syria) are today collectively referred to as Canaanites and the land they inhabited Canaan, based on the biblical accounts, they were several different peoples who shared cultural and linguistic traits but never had a central government. By the time of the Late Bronze Age (ca. 1500-1200 BC), the Canaanites began to play an increasingly important role in the political and cultural history of the Near East in a variety of different ways. The Canaanite kingdoms were subordinate to the more powerful Egyptian and Hittite empires, plying them with much-needed resources, but also playing the role of a buffer zone and sometimes instigator when it suited their purposes. The Canaanites also influenced the region through their language and religion, which spread throughout the Near East and from the Bronze Age into the Iron Age. 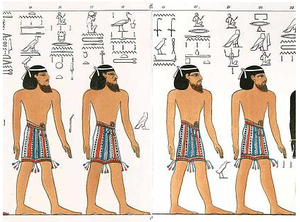 Much of the modern knowledge and nomenclature of the ancient Canaanites is derived from the ancient Egyptians, who were in many ways students of ethnography. Beginning in Egypt’s Middle Kingdom (ca. 2050-1710 BC), the Egyptians referred to the entire Levant, the homeland of the Canaanites, as “Retenu.”  Later, in the New Kingdom (ca. 1550-1075 BC), in addition to the term Retenu, the Egyptians referred to parts of the Levant as “Djay”  and often the Canaanite people with the pejorative “vile Asiatics.” In diplomatic letters exchanged by the more powerful kingdoms of the Bronze Age Near East, the Canaanites and their land were often called “Kinahni,”  which may be the origin of the word Canaanite. Concerning the ethnic and linguistic identity of the Canaanites, they spoke a West Semitic language now termed Canaanite by scholars, which gave rise to the Hebrew and Phoenician languages in the early Iron Age. Since Bronze Age Canaanite culture was decentralized, writing varied in different regions, but by 1600 BC most of the significant Canaanite kingdoms employed some form of alphabetic script. The creation of a written alphabet is a prerequisite to any high-functioning society as it allows a people to record their religious rituals, myths, and history. Perhaps even more importantly, writing allows people to develop more sophisticated governments. Although the Canaanites developed relatively sophisticated city-states, they never had a centralized Canaanite government, which was exploited by both the Hittites and Egyptians in the Late Bronze Age. Each Canaanite state was based around a fortified, sizable city that was controlled by a prince or king,  but the real powers in the region were the Hittites and Egyptians. The Canaanites became part of the power struggle between the so-called Great Powers of the Near East when the Egyptian king, Thutmose III (ruled ca. 1479-1425 BC), conquered the region. Numerous hieroglyphic texts from Egypt document seventeen military campaigns that Thutmose III conducted into the Levant, first to conquer the Canaanites and later as punitive expeditions against recalcitrant city-states. One text describes how the Egyptian king set the terms of Canaan’s occupation with the other great powers of Hatti, Mitanni, and Babylon (Naharin). Although the Canaanites were never strong enough militarily to resist the greater Near Eastern powers, they often played the powers against each other in order to enhance their situations – for instance, if the Hittites offered Amurru less onerous tribute requirements they could abandon the Egyptians and pledge fealty to the Hittites. The Canaanites may have been militarily weak, but they were not powerless or without agency in the constant power struggles of the Bronze Age Near East. Writing was perhaps the most important and enduring impact the Canaanites had on the Bronze Age Near East. As was mentioned earlier, the Canaanites used a variety of written scripts, which proved to be quite adaptable. When the Great Powers of the Near East wrote their diplomatic letters to each other in the Late Bronze Age, they used the cuneiform script in a language that was a hybrid of Akkadian and Canaanite, which modern scholars know as “Canaano-Akkadian.” The language was a blending of Canaanite and Akkadian morphology and grammar, resulting in unique texts that could usually only be read and not spoken and is the only known example of a hybrid language that was only written. The Canaanites’ written and spoken languages would later influence both the Hebrew and Phoenician scripts, the latter of which was adopted by the Greeks. Since the Canaanites were not a unified people and because they lived in a region that was constantly undergoing political and cultural transition, their religion was both influenced by other peoples and later impacted different peoples. The Canaanites, like all of the other Bronze Age peoples, followed a polytheistic religion, where the gods El, Dagon, and Baal/Hadad and the goddess Anath were at the front of the pantheon. Baal, the god of rain and fertility, was the most important Canaanite god and was often syncretically combined with El and Dagon. The Canaanite goddess of war and fertility was Anath, who was the sister and consort to Baal. Anath probably originated in Mesopotamia where she was known as Inanna to the Sumerians and Ishtar to the later Babylonians and Assyrians. The importance of Baal, Anath, and Dagon to the Canaanites is reflected in an ancient Canaanite epic. Just as Inanna/Ishtar spread to the Levant and was transformed into Anath by the Canaanites, the Canaanite gods and goddesses were adopted by and evolved with other peoples. In the early Iron Age, the Phoenicians accepted Baal as their primary god and later took his worship with them to Carthage. Likewise, although the Iron Age Israelites primarily worshipped Yahweh, I Kings tells of how the King of Israel, Ahab (ruled 885-850 BC), married a Phoenician woman and converted to Baal worship. 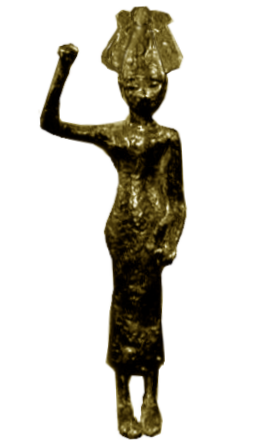 Finally, the goddess Astarte, which was an Egyptianized version of Anath, became popular in Egypt during the Late Bronze Age. The ancient Canaanites did not wield the military or diplomatic power of other peoples in the ancient Near East, but they nonetheless still played a major role in the historical development of the region. 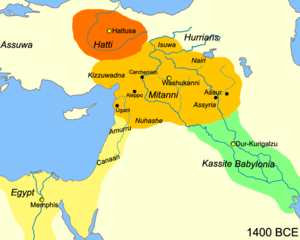 The Canaanites’ role as vassals to the Egyptians and Hittites was important because they served as a buffer zone between the two powerful states and also sometimes as an instigator of conflicts. Perhaps the most profound influence the Canaanites had on the history of the ancient Near East was cultural, particularly in the realm of language and religion because their form of writing, as well as some of their deities, were adopted by other peoples. This page was last edited on 5 December 2018, at 13:07.